May 22, 2017 Brian D. Lawenda, M.D. Whereas acute inflammation protects us from our hostile environment, “chronic” inflammation (a prolonged state of low-level, smoldering inflammation, lasting months-to-years) can hurt or even kill us. This difference is one of the most important discoveries of modern medicine. We now recognize that chronic inflammation is involved in the development and progression of almost every chronic disease…including cancer. The role of chronic inflammation is particularly poignant in the autoimmune and chronic infectious diseases, where the involved tissues are flooded with persistent chemical and protein signaling to repair and grow. Chronic inflammation can also significantly reduce your body’s sensitivity to insulin, leading to persistently elevated levels of blood sugar, increased production of insulin and insulin-like growth factor 1 (IGF-1), metabolic syndrome, type 2 diabetes and obesity. All of these factors have been shown to increase the risk of cancer development, progression and recurrence. Most of us have never heard of “inflammasomes” before, as they were discovered relatively recently (in 2002.) These protein complexes are an integral part of our body’s immune system. They are comprised of special, ‘danger sensing proteins’ that are activated by viruses, bacteria, and free radical chemicals. Once activated, the inflammasomes signal our immune cells (macrophages) to begin to produce a storm of inflammatory proteins. The latest research indicates that inflammasomes are responsible in large part for the chronic inflammatory state that results from obesity. When immune cells first detect any signs of tissue injury or stress, they activate a cellular protein, called nuclear factor kappa-B (or NF-kB.) This protein is the main ‘switch’ that turns on the inflammation in the tissues. 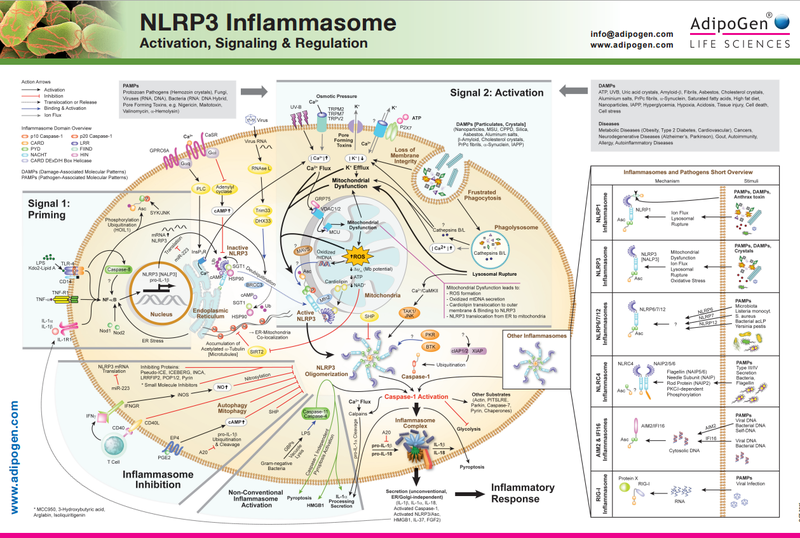 Activated NF-kB signals the cell (via many pathways, including through the activation of inflammasomes) to begin to produce numerous proteins involved in inflammation and tissue repair. During chronic inflammatory conditions, inflamed tissues are predisposed to developing and accumulating DNA damage at a greater rate than non-inflamed tissues. This is due to the production of large amounts of free radicals in inflamed tissues [in fact, billions of DNA mutations develop in our cells each day as a result of free radical injury and toxic exposures.] When these highly-reactive chemicals interact with DNA, they can create DNA mutations. As long as the cell is able to either repair these DNA mutations (most cells have built-in DNA repair mechanisms) or signal the cell to undergo a process of cell suicide (“apoptosis”), precancerous cells will not develop. However, during constant exposure to NF-kB directed signals (which happens during chronic inflammation), both apoptosis and DNA repair mechanisms are shut down. This leads to an accumulation of cells with genetic mutations. If these cells develop enough mutations, they can transform into precancerous cells and, eventually, cancer cells. In the presence of chronic inflammation, precancerous and cancerous tissues are signaled to divide, grow and even invade into surrounding tissues (including blood and lymph vessels, which gives them access to the rest of the body; this is referred to as “metastatic” spread.) These inflammatory signals also inactivate immune cells in the area, preventing them from being able to identify and attack the newly formed cancer cells. One of the sneaky things that cancer cells learn to do to ensure their own growth and survival, is that they can activate their own NF-kB. This enables them to turn on all of the same inflammatory proteins in the surrounding tissues, thereby hijacking the body’s tissue repair and growth mechanisms. What Are Ways To Reduce Chronic Inflammation? Since NF-kB is the main ‘switch’ in promoting inflammation, it makes sense to focus on this target. If you don’t block it at it’s origin (at or before NF-kB activation), there are still ways to block the cascade of events downstream before inflammation develops. Natural compounds and pharmaceutical anti-inflammatory medications that block the key downstream enzymes that lead to inflammation. These include the cyclooxygenases (COXs) and lipoxygenases (LOXs). Most conventionally trained physicians do not assess systemic inflammatory serum markers in their day-to-day practice, as they are considered non-specific (many conditions can lead to ‘above normal’ levels.) Nevertheless, I believe that they can be generally helpful in determining if anti-inflammatory lifestyle changes and interventions are having a positive effect.